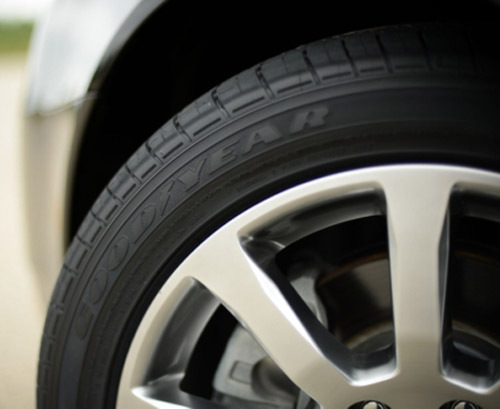 Research by the Goodyear Tire and Rubber Company has revealed the addition of soybean oil to the production of automotive tires can not only extend tread life but also save oil as well. Working at the Goodyear tire plant in Lawton, OK to innovate new ways of mixing the goop that forms tires, the company discovered rubber compounds including soybean oil blend more readily with the silica used in formulating tires. The result is not only tires with 10 percent better tread wear, but also improved plant efficiency and a reduction in power use and greenhouse gas emissions. Petroleum comprises less than one percent of the mix used in making tires, however when the world’s billion cars are considered, each requiring at least four tires, that incremental amount becomes a substantial ocean of oil. The soybean oil tires now being produced at the Lawton Plant will go to Goodyear's Proving Grounds in San Angelo, TX for testing soon. If no performance flaws are found, consumers should be able to buy tires made using the soybean byproduct as soon as 2015. Goodyear received a grant of $500,000 across two years from the United Soybean Board (USB). A Goodyear tire made with soybean oil will be displayedAugust 6-7 at The Ford Motor Company's research center in Dearborn, MI, at an event sponsored by the USB. The use of soybean oil is just one way Goodyear is trying to increase the use of renewable raw source materials. Goodyear, together with DuPont Industrial Biosciences, are jointly working to develop BioIsoprene, an innovative alternative for petroleum-derived isoprene. BioIsoprene can be used to produce synthetic rubber, an alternative for natural rubber and other elastomers. This development will further help reduce the tire and rubber industry's consumption of petroleum-derived products. The company is also conducting research into Air Maintenance Technology. This technology will create tires that remain inflated at the ideal pressure level without any need for external pumps or electronic systems. The components needed to accomplish this will be completely contained within the tires. The benefits of such a system potentially include improving fuel economy, reducing emissions, extending tire life, not to mention enhanced safety and performance. Almost two years ago, The Yokohama Tire Corporation announced using orange oil in tires, because not only does it readily bond with natural rubber, but also tends to maintain surface grip when the rubber becomes hot. Could it be in years to come our tires will be made of a whole medley of fruits and vegetables or is that just nuts?